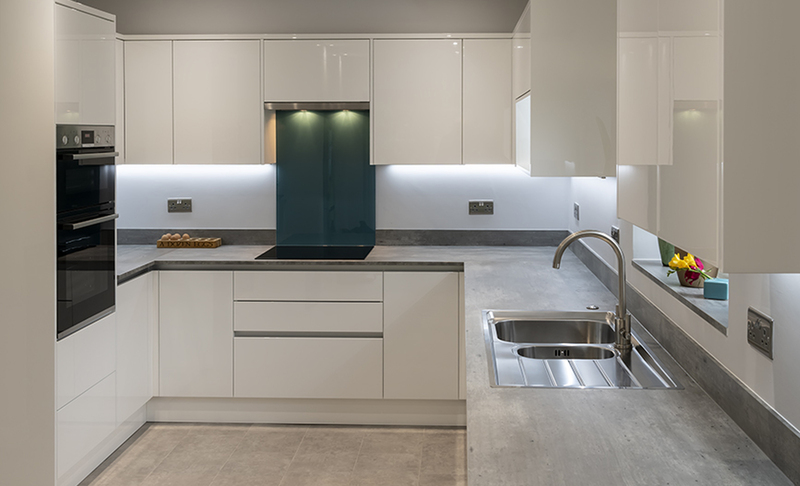 Zola True Handleless Gloss White doors throughout were chosen with stunning Grey Shuttered Concrete worktops for this home in Bristol. As part of a new project the existing utility room was knocked through to the existing kitchen to make this space much larger and brighter. New patio doors were fitted with direct access to the garden and a hidden laundry area was incorporated in the larder units. Bosch appliances, Insinkerata waste disposer and beautiful Aegean Decoglaze glass. Shelving was incorporated to give that softer appearance. A classic kitchen with a modern edge. This beautiful kitchen was installed in what was originally the lounge, allowing the family access to their stunning garden.